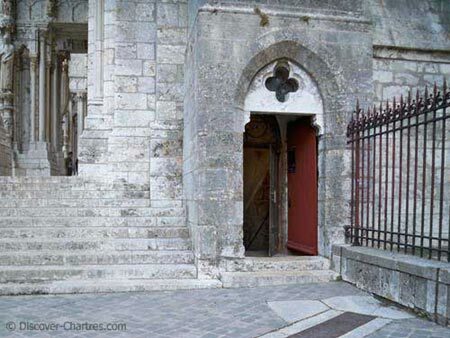 "Chartres cathedral crypt? Do you mean there is a space beneath the cathedral?" That was my American friend's respond when I explained to her that Chartres cathedral has a crypt, which is the largest one ever built in France. She planned to take her mother to visit the cathedral that time. Unfortunately, they failed to go down to the crypt as they arrived outside the visiting hours. Still many tourists do not notice the existence of this crypt, just like my friend I mention above and even myself. 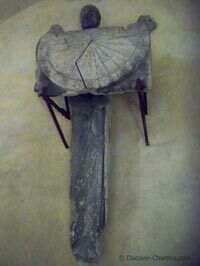 In my early visits to the cathedral, I heard about the crypt but did not really notice about it. Until someday, I saw a small group of people stepped into an entry door and by curiosity, I did the same... and oh my... 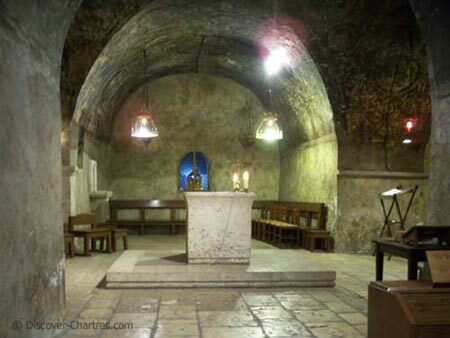 I am visiting the Chartres Cathedral crypt! 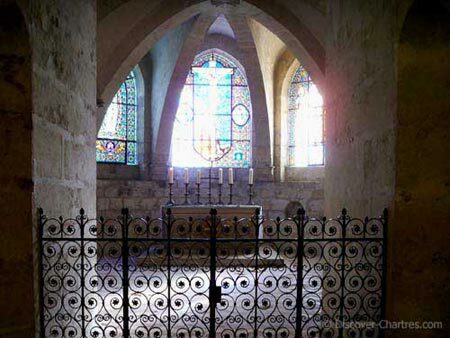 The crypt, dated from 11th century is one of the cathedral elements that save from damages of 1194 fire. Practically it measures the same width as the cathedral and consider as the largest one in all France and the third largest in the world after the one of St. Peter in Rome and Canterbury Cathedral in England. 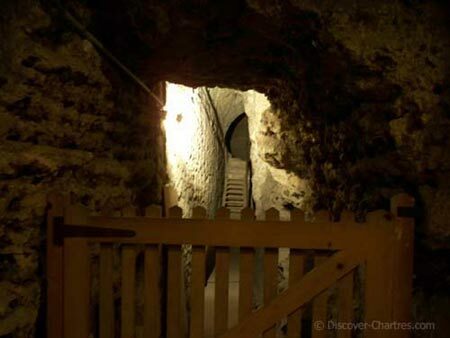 There are two entry doors - from north gallery which lead you to the Chapel of Notre-Dame Sous Terre (Our Lady of the Underground), or from the south gallery. 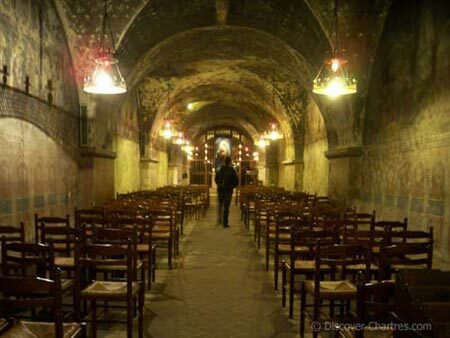 That day I entered the crypt from the north gallery - and here you should arrive at the 70 meters long gallery of Chapel of Notre-Dame Sous Terre. The adventure will then continue by passing the gate, just behind the chapel. 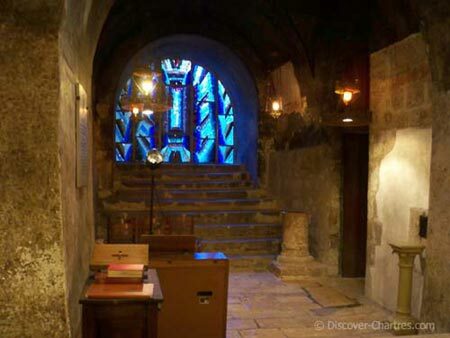 Oh, I think it's necessary to tell you that there are not very much light in the crypt. So if you come with your camera, just prepare yourself to frame in low light! I took the photo above rapidly as I saw the group started to move to another section. Really I did not want to stay alone in front of this excavation! 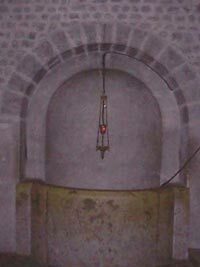 Next you will find the well of Saint Fort, found in 1902, with 33,55 meters depth - while the crypt floor is 24 meters above the Eure river. This means that the well foundation would be at the lower level than the river. The group then moved along the ambulatory. There are seven chapels in the ambulatory of the crypt - three barrel vault chapels of Fulbert and four ribbed vault chapels dated from 12th century. The chapels takes place one after another. 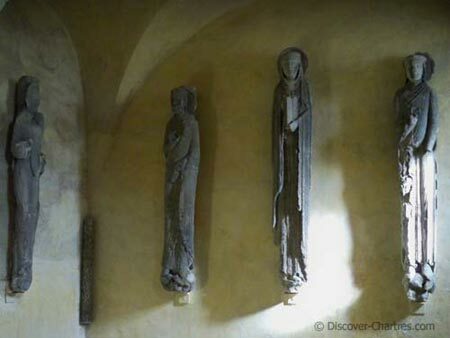 Jamb statues at chapel of Saint Martin - those are the original sculptures of the royal portal. They have been placed here because their poor condition. What you see actually on the royal portal are the replicas. You will find also the angel holding a sundial statue which has been placed here for the same reason of those jamb statues of the west facade. Now the replica replaces it and you can see it at the corner between Royal portal and South portal. 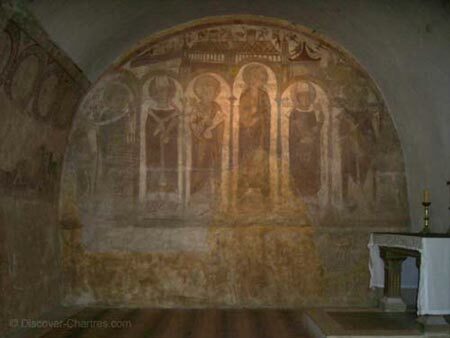 At the chapel of Saint Clement, you can see the Romanesque wall painting (fresco) with the figures of Saint Clement, Saint Nicolas, Saint Martin, Saint Peter (St. Pierre), Saint James the Major (St. Jacques le Majeur) and Saint Giles (St. Gilles) celebrating mass before Charles Martel (Charlemagne). The wall painting, dated from 12th century, has been restored in 1966. La Crypte souvenir store from April 1 to October 31 18 Cloitre Notre Dame, situated in front of the south entry door of the crypt. The visit itself will cost you 2.70 € (free for children below 10 years old) and lasts during 30 to 45 minutes. If you come in group, you should first take an appointment with the guide (guide available only in french). April 1 to October 30 opens from 11am (except Sunday and feast days), 2.15pm, 3.30pm and 4.30pm. Additional hours at 5.15pm from June 22 to September 21. November 1 to March 31 opens from 11am on Tuesday to Saturday (except feast days), 4.15pm on Wednesday to Sunday (except feast days). No visit to the crypt on Monday. The information above may not reflect changes, please confirm by yourself before heading off.